Board Members Celebrated it’s Winter Meeting and The 2016 Best Practices Showcase in San Juan, PR. HETS Board Members during winter meeting at the Universidad del Este in Carolina, PR. The HETS Board of Directors winter session was successfully celebrated in San Juan, PR concurrent with the 2016 Best Practices Showcase. These events were held at the Escuela de Hospitalidad y Artes Culinarias José A. “Tony” Santana, hosted by Universidad del Este, AGMUS. 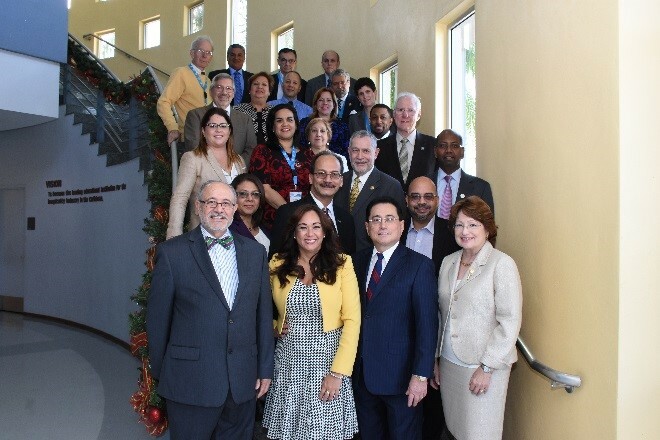 Representatives of more than 25 member institutions from Puerto Rico, New York, Texas, Missouri, and California were present at the meeting and agreed on the priority activities for the next semester. The first session took place on Thursday January 14, as part of the series of events scheduled after the Best Practices Showcase Conference opening plenary session. A second session was held on January 15, to discuss initiatives and future plans between HETS Board members and its Corporate Partners. Besides allowing the discussion of the key accomplishments of the organization during the first half of the 2015-2016 academic year, this meeting was crucial in the open discussion of the progress on the approved Strategic Plan of the organization from 2012 through 2017 that focus on access, retention and assessment. Among the exiting news shared with the Board of Directors, one was the fact that Southeast Missouri State University and Lighthouse Translations & Interpretations were welcomed as new institutional member and corporate partner respectively that just joined the HETS Consortium. Efforts for the first half of this academic year, includes the continuation of tailored online workshop offerings, additional tools and services added to the HETS Virtual Plaza, Online Resources, and alliances. Also, the newest members of HETS Student Committee had the opportunity to present the results of the 2015 Student Leadership Showcase event and provided their plan for this academic year including new tour and tailored workshops for their peers at HETS member institutions. Board Members began with the preparations for nomination of new candidates for its Executive Committee and as a result was established the nomination committee to begin the process that will lead to the election during their summer’s meeting at Lehman College in New York. Board members also had the chance to network and exchange thoughts with representatives from corporate members, who participated in the corporate session. During the winter meeting, the HETS Annual Report was shared and distributed among attendees. Click here to access the PDF version of the HETS Annual Report for 2014-15 for your information and review. We look forward to continuing strengthening HETS initiatives this year to foster a greater collaboration among all of our members, affiliates and widen our partnerships with other organizations. For more information about HETS projects, please contact the HETS office at 787-250-1912 exts. 2372, 2373 or send an email to: info@hets.org.